The November issue of Bike Buyers Guide is now in the shops and MAG Ireland has been afforded the opportunity to explore some of the challenges facing riders today through a page in the magazine. Last month we took a look at the Roadworthiness Testing proposals and examined the evidence behind them. This month we look at the attitudes of others – authorities and individuals alike – towards us as riders and how this can affect us every time we go out on two wheels. 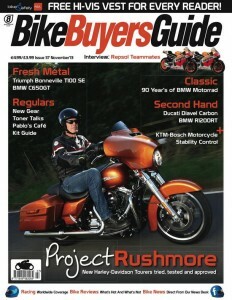 Read all about it exclusively in the current issue of Bike Buyers Guide. Read MAG Ireland’s page in November’s Bike Buyers Guide – Out now. The November 2013 issue also features a great range of content by top contributors as well as reviews of the Triumph’s Bonneville T100SE and BMW’s C650GT. The new Harley Davidson tourers are tried and tested as is the stunning Ducati Diavel. There’s also coverage of the racing scene, a look back at 90 years of BMW Motorrad, and the widest selection of news and views on Irish motorcycling that you’ll find anywhere.